[Lizzie] from LustLab sent in her Ball of Dub that turns a few accelerometer and a digital audio workstation and turns everything into an aural experience of wubs and dubs. The Ball of Dub can turn just about anything into dubstep, and does so with a fairly interesting user interface. There isn’t a build log for the Ball of Dub, but the folks at LustLab did send in a basic overview of her project. Inside the ball, there’s a Razor IMU from Sparkfun that is attached to the ever-popular XBee wireless transceiver. A tiny program on an Arduino calibrates the gyroscope and accelerometer and sends that data to the DAW at 50Hz. The host computer is running Renoise, a very popular tracker that can accept MIDI and OSC input. A Processing app parses the ball spin, free fall and impact, averages them over a period of time, and pipes that into the OSC input of Renoise. In [Lizzie]’s video, the ball spin is sent to a low-pass filter on the baseline track, and the average impact is applied to the vocal track. This isn’t the first time we’ve seen some fairly strange ways to modulate wub; we saw real instruments covering Skrillex earlier this month. The Ball of Dub wins in the simplicity department, though. [Brian] was trying to decide on a Halloween costume this year, and while looking through his lawn decorations, inspiration struck. 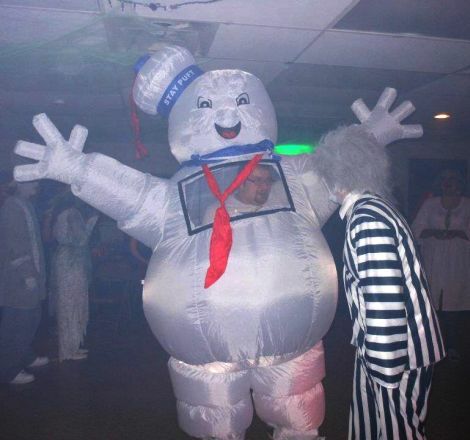 In his collection he had a 9 foot tall inflatable Stay Puft Marshmallow Man, and being a guy who likes to go big or go home, he knew he had to find a way to wear it. The first task he had to tackle was ensuring that he could keep the display inflated while on the go. He was dismayed to see that the fan’s power supply was rated for 12v AC, but when he hooked it up to a DC power supply it worked just fine. While he had his speculations, he wasn’t 100% sure why it worked but he went with it anyway, connecting it up to a battery that would keep the costume inflated throughout the duration of a party. With that out of the way, he focused more on the mobility of the costume, adding a clear window to allow him to see, along with tweaking a few other small items. The costume looks great, and we’re sure that [Brian] is yet again the hit of the party. When you’re away from home and your cellphone runs out of juice it can be a real downer. Sure, you could find a store and buy a wall charger, but wouldn’t it be more fun to build your own battery booster without using tools? [Spiritplumber] did just that, popping into a Radio Shack for the parts, then making his how-to video (embedded after the break) while standing at the checkout counter. You can see he hust set his camera on top of the battery display case and got to work. He’s using four D cell batteries to provide 6 volts of power. Assuming your phone charges at 5 volts this is going to be just a bit too high, even though there’s some tolerance with most phones. To overcome that obstacle he added a diode to the circuit, taking advantage of the 0.7 volt drop that it brings to the mix. Grab a plug adapter for your model and then just hand twist the connections. [Spiritplumber] admits it would be better to solder these, but in a bind you can get away with it. We looked up some prices for this method and we figure this would cost around $18 (batteries included) depending on the price of the plug adapter for your phone. Of course if you’re just looking for a way to charge your phone without paying consumer prices there are ways of accomplishing that as well. [Ytai], the lead developer for the IOIO breakout board for the Android Open Accessory kit, figured out how to control just about anything from an Android phone wirelessly over Bluetooth. When [Ytai] first announced the IOIO breakout board for Android devices, one of the commentors on his post said a standard Bluetooth dongle could stand in for the USB cable between the phone and the IOIO. Wireless control of home automation project and robots was just too good of an idea to let go, so [Ytai] dove into this new Bluetooth project. After getting a cheap Bluetooth dongle from DealExtreme, [Ytai] found btstack, a lightweight Bluetooth stack that was perfect for an embedded environment. Dealing with the USB driver for a no-name Bluetooth adapter didn’t come as easily, but after a few long nights, [Ytai] emerged victorious. He still has a few more problems to overcome. Namely, supporting environments where more than IOIO board is available. [Ytai] is thinking about adding support for WiFi dongles, something we’d love to see. Check out [Ytai]’s demo of wireless control of a servo after the break. Here’s the latest project from [Niklas Roy’s] workshop. 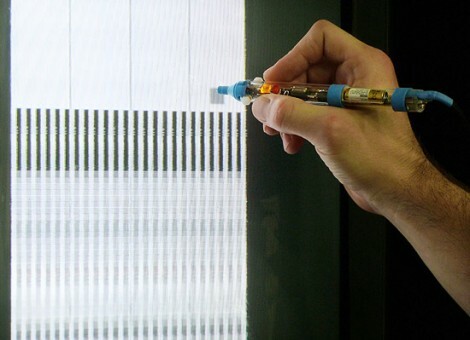 Lumenoise is an audio synthesizer controlled by drawing with a light-sensitive pen on a CRT television. The pen is a self-contained module which connects to the TV via audio and composite video RCA plugs. Inside the clear pen housing you’ll find a microcontroller which generates the audio and video. The business end of the pen contains a phototransistor which lets the ATmega8 take a reading from the video screen. Since the chip is generating that video signal, it’s possible to calculate the pen tip’s position on the screen and modulate the sound output based on that data. You can watch a recording of the results in the video after the break. This is a very simple circuit to build, and [Niklas] makes the point that most of us have a CRT hanging around in a dark corner somewhere. We think this would be a fantastic soldering project to do with the kids, and that this would be right at home as a children’s museum piece because of the wow factor involved in playing around with it. We can really tell from this and some of his past projects that [Niklas] just loves the 8-bit audio. Make sure your health insurance premiums are all paid up; if you decide to replicate this project you may need it. 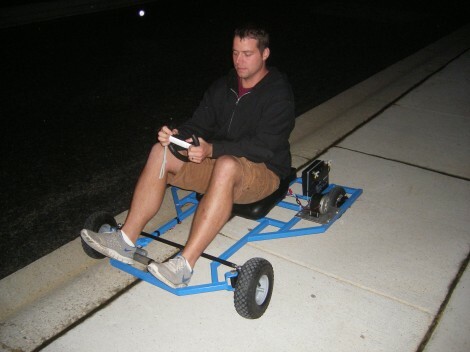 [Corey], [Kris], and [Jess] built their own go cart which is controlled with a Wii remote. The website has a poor navigation scheme, but if you hover over the horizontal menu bar you can get quite a bit of information about the build. The cart has two motors which use a chain to drive each of the rear wheels. A pair of H-bridge controllers let the Arduino interface with them. It’s also has a Bluetooth module that makes it a snap to pull accelerometer data from the Wii remote. The front end looks like it uses rack and pinion steering, but you won’t find a pinion or a steering column. Instead, a linear actuator is mounted parallel to the rack, moving it back and forth at the command of the Arduino. We can’t help but think back to silent movies where the steering wheel comes loose in the middle of a car chase. See if you get the same image while watching the demo after the break. This doesn’t seem quite as dangerous as adding remote control to a full-sized automobile, but we’ve played MarioKart Wii before and know how lousy the accelerator performance can be. Hopefully the firmware kills the motors if the batteries in the controller die. Our most popular post this week was about how to use HTML5 to display sensor data. This is a pretty interesting demo of the new web technology. Next up is a post about an animatronic zombie that can crawl around via remote control. It is surprisingly maneuverable and would definitely be creepy crawling towards you in the dark dark middle of the night. 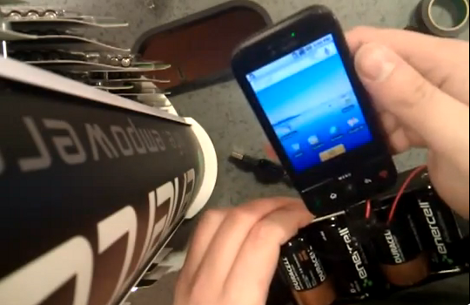 After that is a post where our own [Kevin Dady] created a new charger for a cell phone that he recently acquired. This is a pretty comprehensive tutorial that could be of use to others who may have misplaced their charger and have some spare parts lying around. Next we have a post about a new technology that has been created that lets you render objects into photos that have been previously taken. Finally, there is a post about a research project that uses a Microsoft surface and a whole mess of proximity sensors to detect where people are located and which hand they are touching the surface with.